The use of radiometric and quasi-optical principles enables obtaining remote thermal portraits of the studied liquids in a closed dielectric container for distances from few centimeters to several meters. Microwave angular polarization radiometric scanning was used for the first time, and allows to remotely obtaining authentic thermal portraits for liquids that are similar in their physicochemical properties. It was experimentally shown that objects that have nearly indistinguishable thermal portraits (water-alcohol solutions, diesel fuels) in case of linear scanning, reveal signatures that make it easy to identify them and also to distinguish the dielectric containers for liquids in case of angular scanning. The method of angular radiometric scanning enabled obtaining the components of transmitted, absorbed and reflected waves for the authentication of liquids based on their thermal portraits in one measurement cycle. The broadband noise electromagnetic wave generated by the illumination source carries the information about the liquid and the container. The use of angular scanning reduced the time for obtaining useful information to 14 s or 4 times compared with linear scanning. The results of the study of hazardous liquids are presented on the example of combustible liquids: refined petroleum products (solvents, diesel fuels) and aqueous-alcoholic solutions in containers with dielectric constant - = 2–16. It was experimentally shown that a microwave radiometric thermal portrait carries information about the number of molecules with a weak hydrogen bond in aqueous-alcoholic solutions. The proposed method for remote identification of liquids in a closed dielectric package is safe and environmentally friendly, since the required level of the illuminating noise radiation does not exceed the value of 20 dB/kT0. Russian Text © A.V. Pavlyuchenko, P.P. Loshitskiy, A.I. Shelengovskiy, V.V. 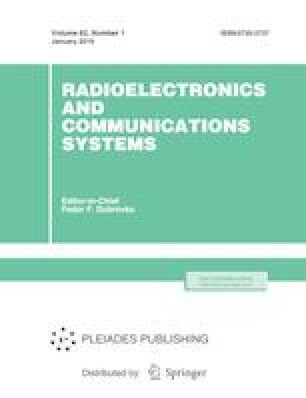 Babenko, 2019, published in Izvestiya Vysshikh Uchebnykh Zavedenii, Radioelektronika, 2019, Vol. 62, No. 1, pp. 16–29. This study is supported by the NATO Science for Peace and Security Programme. Project G5005.